people-related programs, policies, and practices. 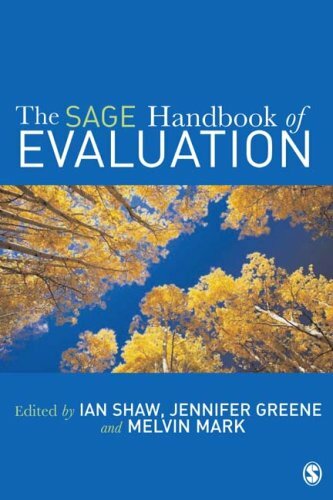 The SAGE Handbook of Evaluation is a unique and authoritative resource consisting of 25 chapters covering a range of evaluation theories and techniques in a single, accessible volume. With contributions from world-leading figures in their fields overseen by an eminent international editorial board, this handbook is an extensive and user-friendly resource organized in four coherent sections: Role and Purpose of Evaluation in Society Evaluation as a Social Practice The Practice of Evaluation Domains of Evaluation Practice The SAGE Handbook of Evaluation is written for practicing evaluators, academics, advanced postgraduate students, and evaluation clients and offers a definitive, benchmark statement on evaluation theory and practice for the first decades of the 21 st century.